Simo was built in 1961 by the Percy See boatyard in Fareham, of Pitch Pine and Oak with a lead keel. She differs from most Vertues in that she has a bowsprit, which means that she can be sailed as a Cutter with a double headsail. 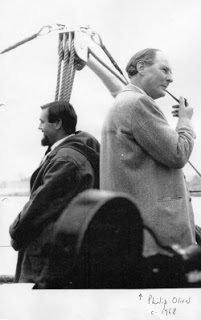 She has two claims to fame: first, her original skipper was Philip Oliver, who completed a notable voyage from Casablanca in Morocco to Falmouth in 1963; a trip of over 1000 miles. Philip and his daughter Janet owned Simo until 1989, before she was bought by new owners (I don’t know who). Mick looking relaxed on his way from Portugal to the Azores. If you are interested in Vertues (or even just sailing), I highly recommend these blogs. The most recent of the blogs is Simo the Vertue. Mick has also uploaded quite a few videos to Youtube, including a series from Simo’s penultimate voyage from Portugal to Horta in the Azores, a trip of over 1000 miles, which he completed with a crew member Dave, who filmed them on a GoPro and uploaded them to this link. 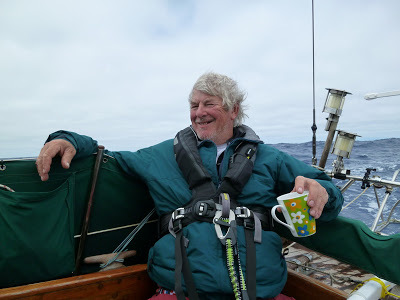 Sadly, in July last year, Simo sank 6 days out from the Azores on the way to Falmouth while Mick was sailing her singlehanded. It looks like she hit a submerged obstacle (possibly a container), developed a bad leak in the bows under the chain locker. Once Mick realised the severity of the situation, he had to abandon ship and was picked up by a passing fishing boat. She was a gorgeous boat. Here is a clip of Mick sailing her in Majorca.